We love learning about pet relocation from as many perspectives as possible, so we were excited to run across a blog written by one of our recent clients describing a successfully-carried out cat move. Apparently the Johnson family, who just moved from the US to Switzerland, had never heard of a company like PetRelocation.com, but they were happy to discover our services—especially once their cat, Ezra, was delivered safely to their door! Jared, the author of the blog View From LeDeck, recalls the steps of Ezra’s journey and seems pleasantly surprised by how things went. Scotty, the Pet Relocation Specialist who handled the move, said it all went well for a couple important reasons—the cooperation of Ezra’s vet as well as the clients’ willingness to trust in Scotty’s experience and knowledge both helped immensely. 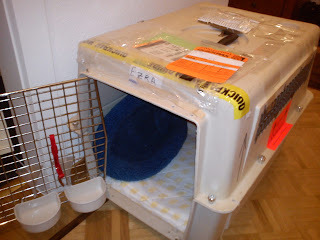 The Pet Import Requirements for Switzerland can seem complex, but the story of le chat just goes to show that, with a little organization and professionalism, international pet travel can be carried out free of turbulence. Visit Jared’s blog to read more about life in Switzerland and Ezra’s arrival home. We like the part about the travel crate: says Jared, “do you remember those old Loony Tunes cartoons when Bugs Bunny would streak around the world in 5 seconds and return to the screen with a suitcase covered in stickers and stamps from all the cities he’d been through? Ezra’s cage reminded me of those cartoons…” It was also heart-warming to hear how happy Jared’s two sons were when they were finally reunited with Ezra. Read the whole story here! Jared finishes with a few kind words that definitely made our day a little brighter, “I think Petrelocation.com is really a great service, especially for people who see their pets as a true part of the family instead of just as a pet.” Thanks again, and good luck in your new home!